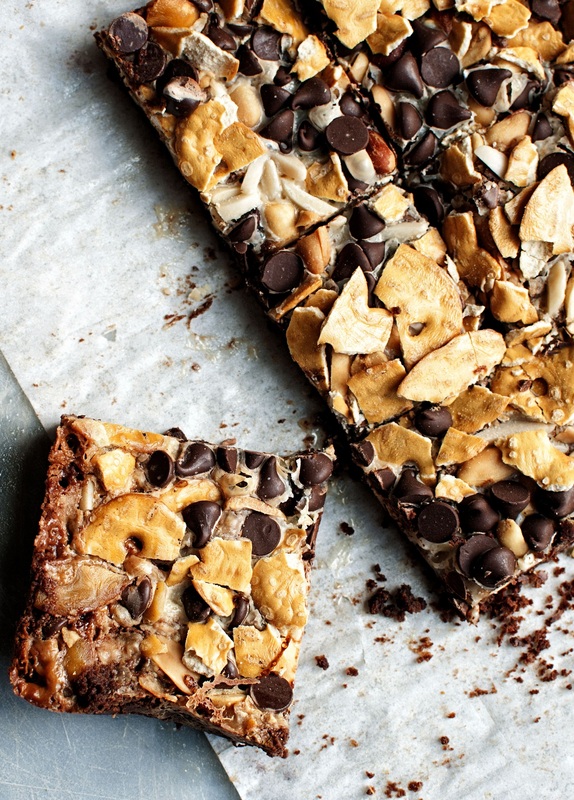 Cowboy 7 Layer Cookie Bar: A twist on the classic 7 layer bar inspired by Trader Joe’s Cowboy Bark. Oreo bottom, peanuts, almonds, toffee, pretzels, and chocolate. I remember the first time it happened to me. The pain. The drama. The first time Trader Joe’s stopped carrying a product I really loved. Back then it was mini meringues. They were so tiny that you could eat 100 of them for a serving. And when I was on WW…getting to eat 100 of anything sounds amazing (back then only two points). Plus they were tasty. They still carry the large ones but it wasn’t the same. Soon after that I learned that many others like me suffered from this Trader Joe’s affliction. Now I don’t eat Cowboy Bark often but I have many, many a friend addicted to it. Last year I made Cowboy Fudge and that was really good. 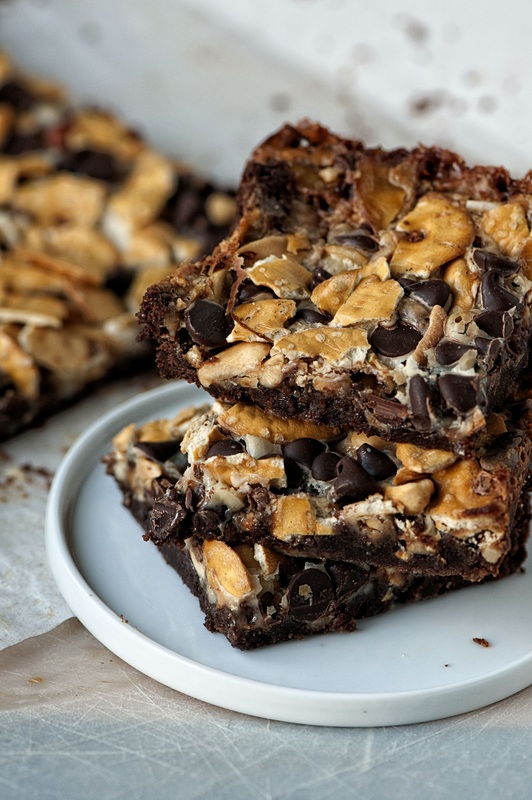 I was recently at a gathering and someone served good old fashion 7 Layer Bars, the kind I grew up with. I’m not sure what made me decide to try and make the Cowboy Bark into a layer bar but I’m glad I did. An Oreo (or Jo Jo) cookie crumb base. Topped with sweetened condensed milk. 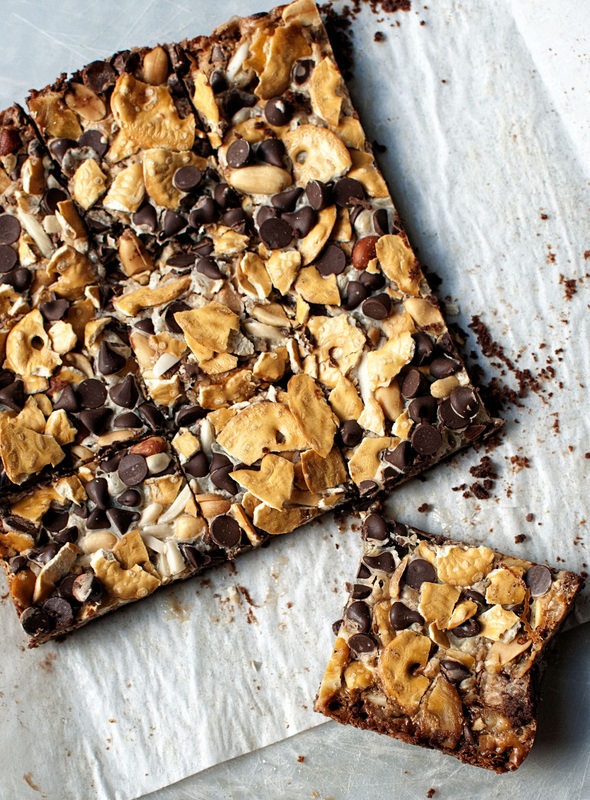 Then toffee pieces, salted peanuts, almonds, chocolate chips, and pretzel thins. If you are a Cowboy Bark junkie you will need to make these…especially since Trader Joe’s may stop making your bark one day with no warning. Combine the Oreo cookie crumbs and melted butter in a bowl. Press into the bottom of a 9-by-13-inch baking dish. Pour the sweetened condensed milk over the cookie layer. Press down the pieces with wax paper or a fork. You always have the best titles. I love that they are never boring like cheese soup or banana bread. As someone who has suffered a Trader Joe’s loss this cracks me up so much. It’s true that I live in fear they will take away my favorites at any time. So need to make these bars. I pretty much stopped shopping at Trader Joe’s when they discontinued my favorite coffee…..clearly they have carried on quite well without my shopping dollars, but I felt I had to take a stand. YUM! I want to add coconut, so good! Sorry, we just moved and I was out of internet for over a week. I fixed the recipe. Hopefully, you made them though as you can kind of tell from the photos that they go on top.